Notre Dame Street has become such a hotbed of restaurants in the Sud-ouest that it is hard to keep up with all good places to try…. even when I live in the neighbourhood! One such place is Hvor – a restaurant that, when it opened a few years ago, got great reviews but that I never found the time to check out. 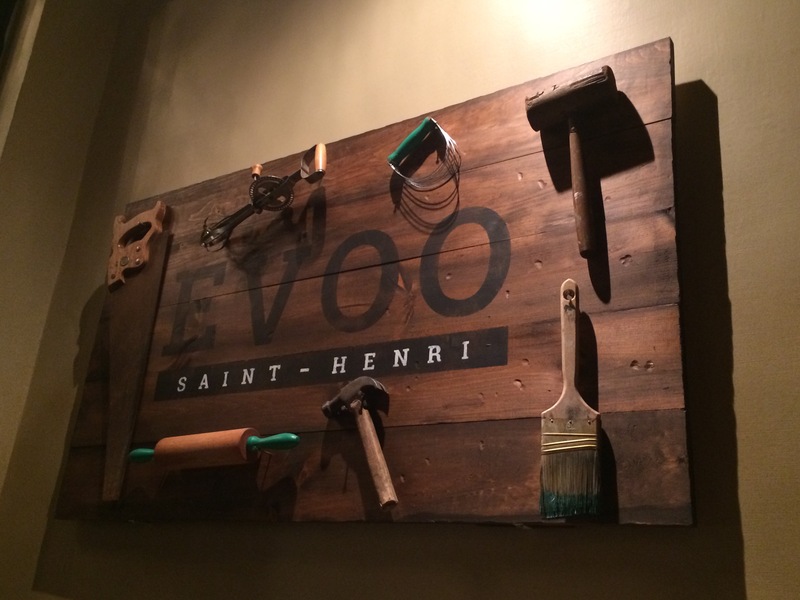 Recently, friends of my wife’s invited us out to dinner and we decided on Hvor as the destination. I was very curious to see if the initial positive buzz was still deserved. Hvor’s focus is local organic produce – the menu changes weekly based on what they get from the market, from local producers and also from their own terrasse garden – where they produce a number of different vegetables, herbs and even honey. There are a few tables on the terrasse so you can sit in the garden for dinner. Sadly, as it is a first-come-first-serve basis for that, we were not able to get one of those tables. Instead, we sat inside. 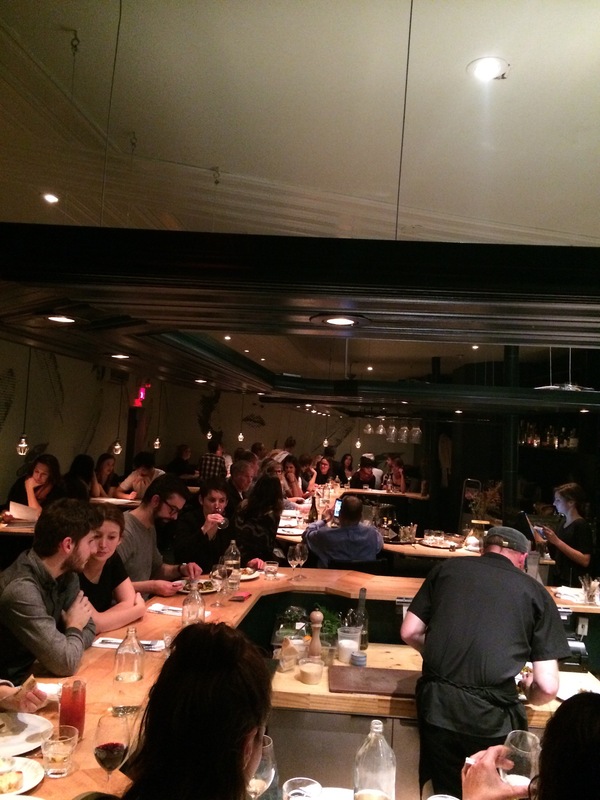 The space is very industrial modern – a big contrast to the earthy market style food they focus on. It is a clean and open space with a large bar being the big eye catcher in the space. On the sunday evening we were there, it was very quiet but I can imagine a pretty noisy environment if the room is full. 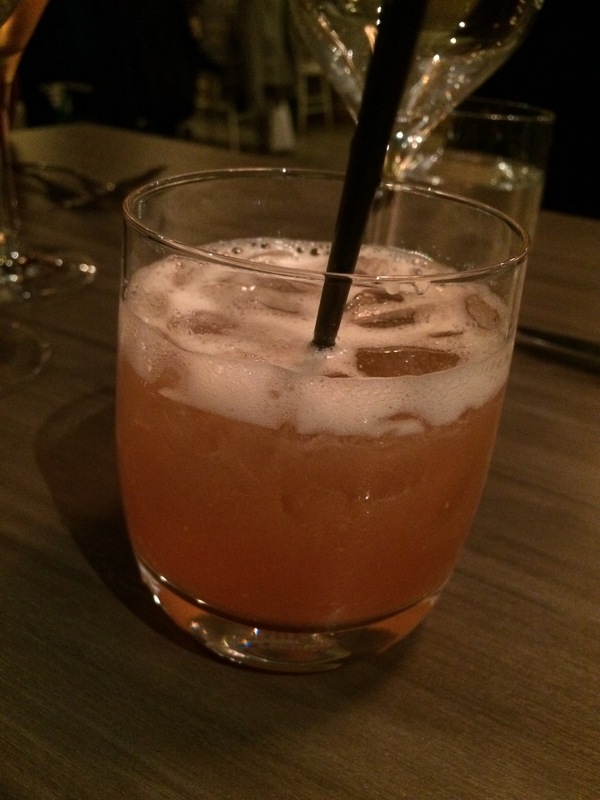 Ste-Marie rhum with sea buckthorn variations, orange minthe and ginger beer. Very nicely balanced between the rhum and the more fruity elements of the drink. Beautiful presentation as well using the buckthorn. 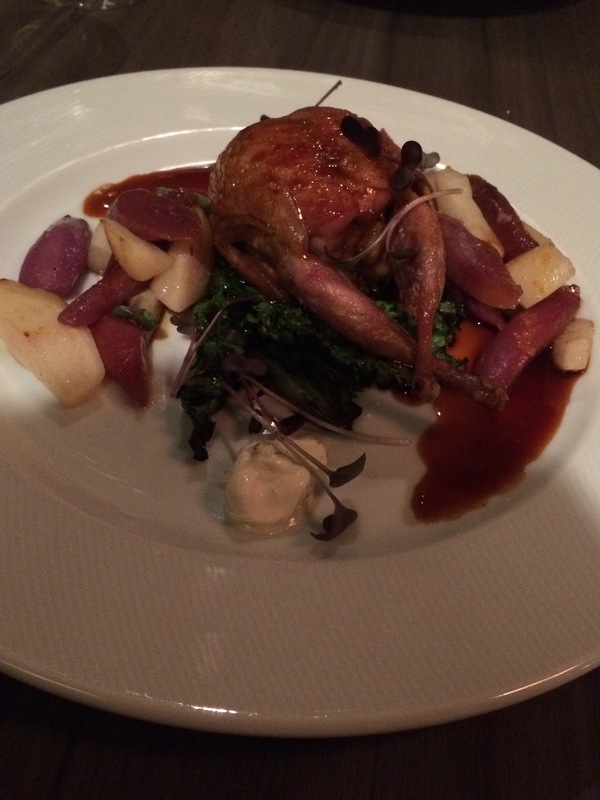 There are a few menu options available – you can go à la carte – either full plates or sharing style – or tasting menu. We chose to go à la carte sharing but allowed our waiter to choose for us – we couldn’t decide exactly what to go for. Up first, a amuse gueule of sour cream, melon foam and roe eggs. An interesting balance of textures and flavours. A good omen for what was to come. Our first courses arrived soon next. We got some locally produced sourdough bread with fermented butter and charcoal – beautiful crust on the bread with a nice yeast body. 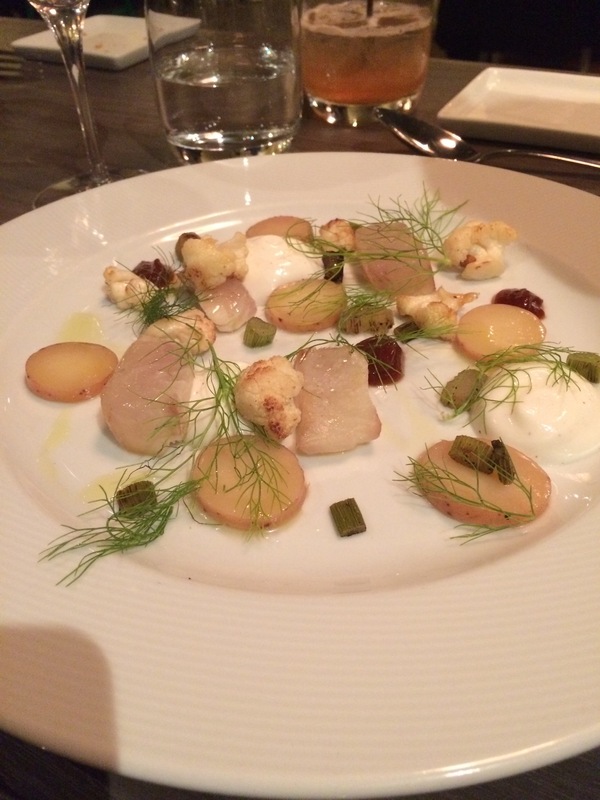 Next we had some grilled Princess scallops from Gaspé served with hazelnuts. The scallops were rich and tender with a nice grill to them. I never would have considered hazelnuts as a pair with scallops but their strong earthy flavour worked pretty well here. Our final appetizer was a platter of maquerel sashimi and sliced scallops with a host of veggies. Beautiful presentation. A dish of finesse and execution. The scallops and mackerel were delicious. The little extras paired nicely overall. Our second course kicked it up further. First we had a cold gaspacho served with grilled halloumi, roasted tomatoes, carrots and radishes. Delicious dish – I always love grilled halloumi and the rich saltiness it brings. That paired very nicely with a smooth velvety tomato soup. The main dish was an trio of grilled meat from their menu: duck, lamb and steak served over a beet corn risotto with some potato chips. The three meats were beautifully grilled and cooked well. Wonderful tenderness to all of them. I get the idea of the potato chips to add some crunchy texture but frankly while they were good, I don’t think it worked all that well in practice. The beet risotto however was wonderful – bright and flavourful, rich and creamy. The addition of the fresh corn worked well as well. The final dish was a platter of desserts – we got amongst others a dark chocolate Paris-Brest, a rice and coconut cake, a pistachio cake with pickled rhubarb and some candied peaches. At this point, we were pretty stuffed but we found a way – my wife loved the strong pistachio flavour of the cake in particular. Personally, I was more a fan of the Paris-Brest and how they used dark chocolate to contrast the usual sweetness of that dessert. 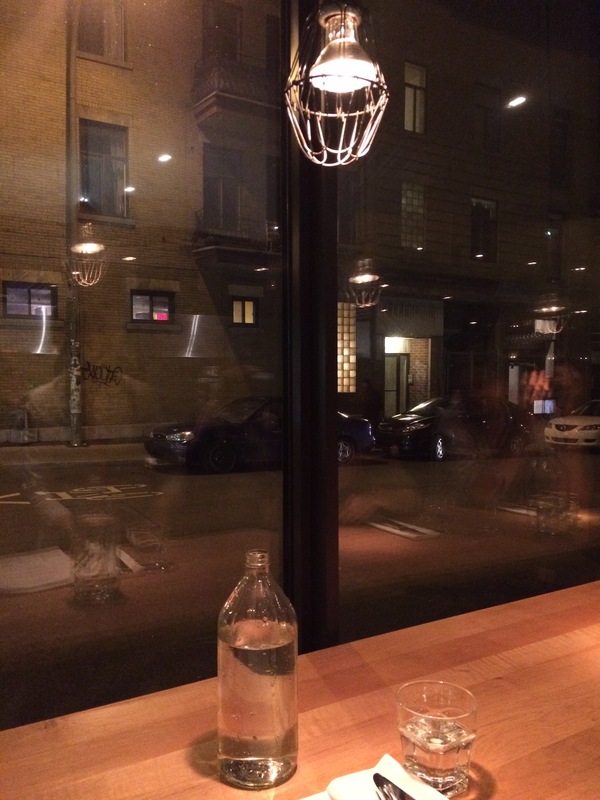 Hvor was a fun experience from beginning to end – we got very nice and personal service all evening. We even got a tour of the garden at the end of the dinner. The only negative being how long it took to get the check to pay at the end. The food was delicious, presented beautifully and well executed. It took us a while to get here but I’m happy to see that Hvor is still worthy of the praise it got at its opening. Tasting menus can be scary to some people. Will I like all the dishes served to me? Why can’t I just order what I want? Or more importantly, do I trust the chef enough to fully guide my restaurant experience? Fundamentally that is the question when confronted with a tasting menu. Personally, I think the tasting menu is a great way to evaluate a restaurant as it should technically be what the chef wishes to serve you. If you don’t like the tasting menu then I suspect the restaurant will not be for you. 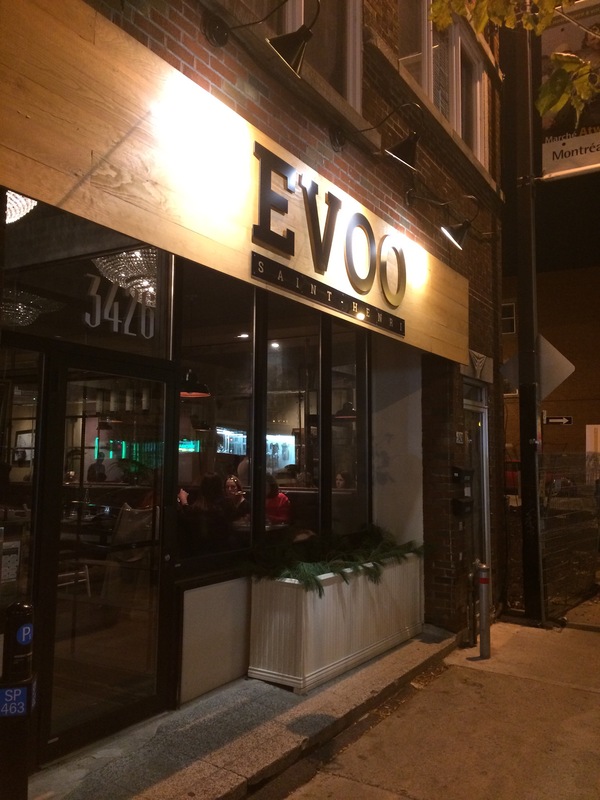 In Montreal, a few recent restaurants have decided to go only tasting menu – a bold choice but one that certainly can be interesting. One of these is Le Fantome. A relatively new restaurant located in Griffintown, Le Fantome has received plenty of rave reviews since their opening and actually switched to an only-tasting menu option sometime after their opening. 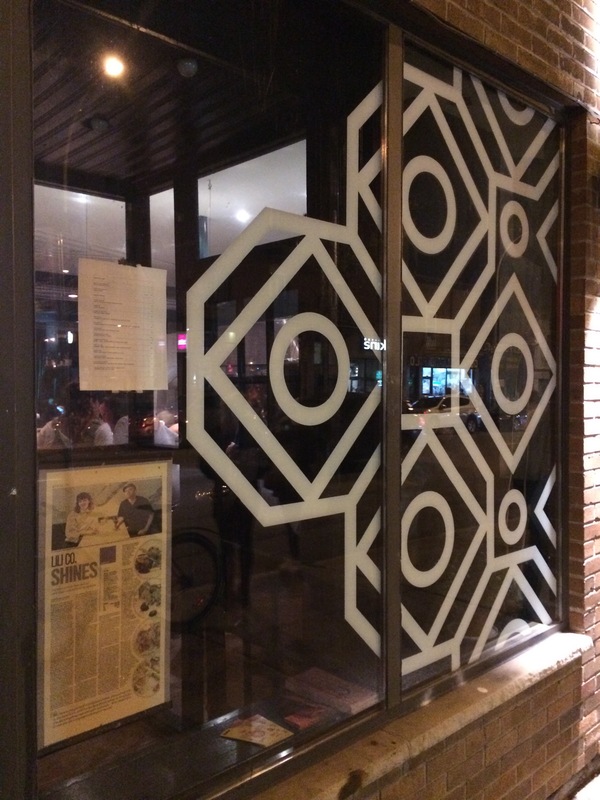 Given their close proximity to my place, it was a perfect date night spot for my girlfriend and I a few weeks ago. 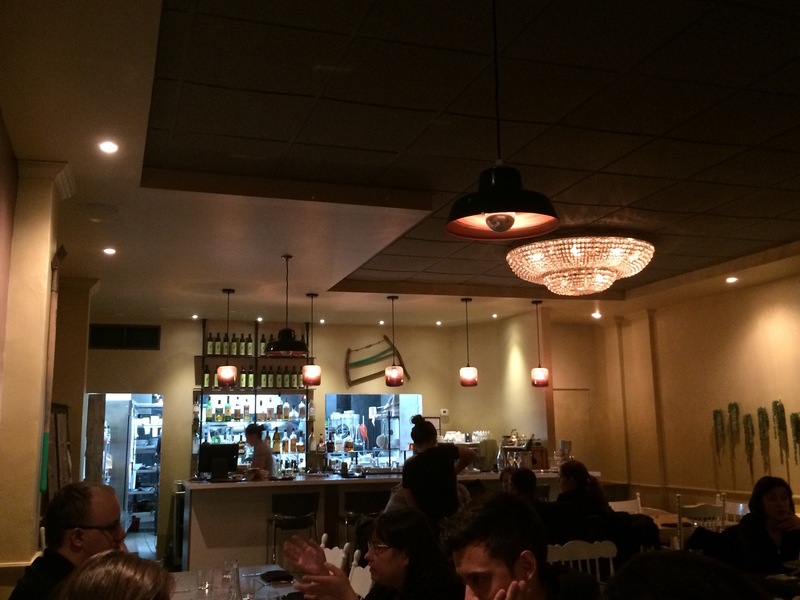 Hidden on William street, Le Fantome is very unassuming from the outside. In fact, you’re likely to miss it when you drive by. The narrow room is sparsely lit decorated only with abstract paintings from chef Jason Morris’s great- grandfather. Not my style artistically but it goes create a nice intimate setting. Noise level was relatively high when we arrived but decreased nicely as the night went on. As our table was not ready, manager Kabir Kapoor provided us with a couple of glasses of white wine for our troubles. That level of quality service continued throughout the night. Very attentive and friendly. 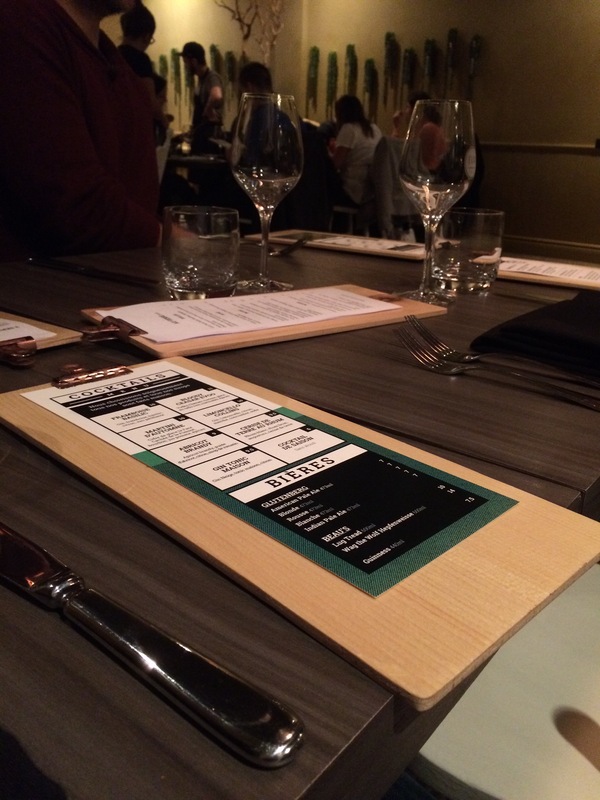 Once we were sitting, we were provided a menu with both a small or large tasting menu to choose from. 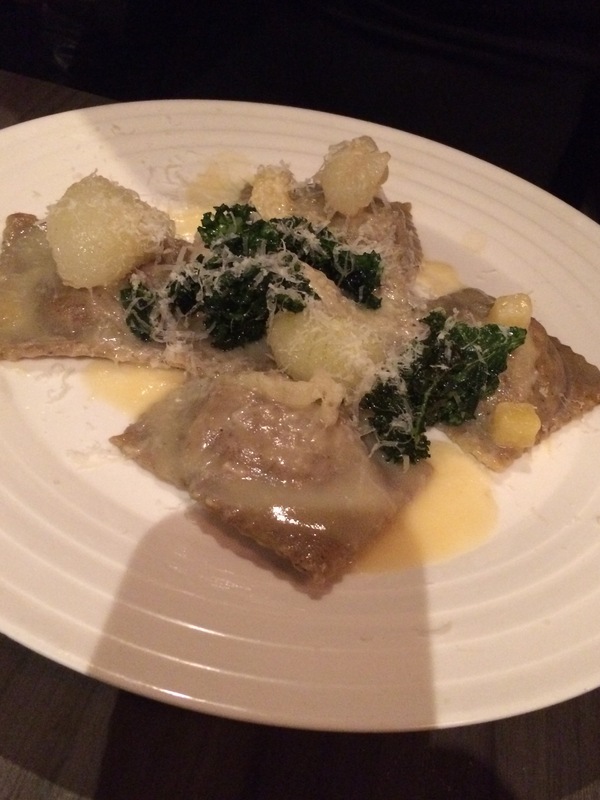 The menu simply listed the primary ingredient of each dish. The rest was explained by our wait staff as we received each dish. I went for the larger tasting menu which was comprised of 7 plates and 2 desserts. First was a simple amuse bouche of blackberries with foie de volaille. A nice combination of sweet and richness. Our second course was a beet salad with creme fraiche, almonds, pistachios and graham crackers. This course let us know that we would be in good hands on this night. The beets were fresh and sliced thinly. 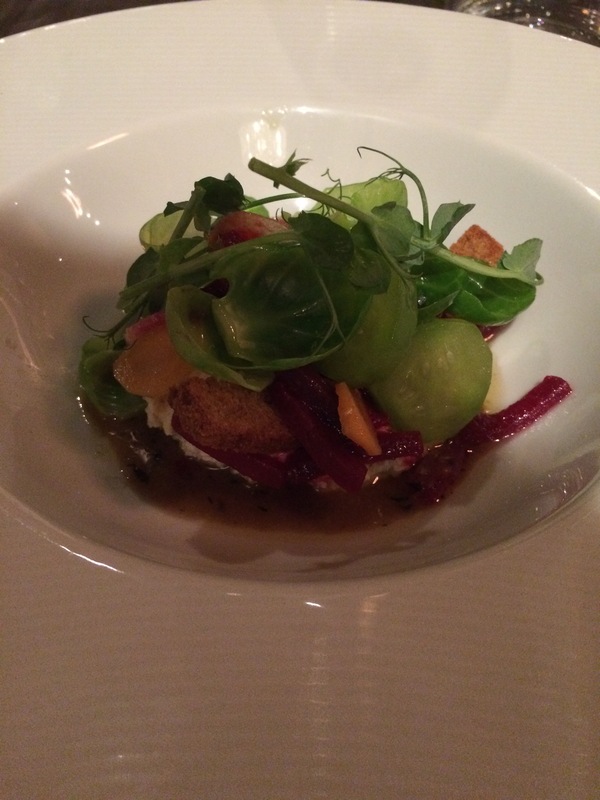 The richness of the creme fraiche paired so well with the beets. The nuts brought a little crunch and the addition of the graham crackers added a extra hint of sweetness. A wonderfully balanced dish. Third course was a raisin and blueberry salad with black liquorice. Pretty simple overall. I was surprised at how the black liquorice came through but there wasn’t much to get excited about here otherwise. The fourth dish was a beef tartar with red peppers, olive oil and elephant garlic shavings. Served in strips, the beef was nice and tender. The dish has good kick to it – reminded me as a stir-fry from a flavour profile. I honestly didn’t pick up the garlic very much. The sweetness of the red pepper was more noticeable. The next course was a little more unique – Popcorn risotto. A very creamy risotto with actual popcorn mixed in. A cool textural play and the popcorn brought a nice buttery flavour to the dish. I honestly found the risotto itself lacking any punch without the popcorn flavour-wise though. The next dish was salmon lightly poached with kombucha spices, crispy skin, basil and lemon puree. Pardon the bad photographer for the shoddy picture – doesn’t do its presentation service. My girlfriend didn’t enjoy the almost raw texture but I found it interesting. The basil and the puree were the big flavour providers though. The spices didn’t do much for me. The seventh dish was a standout for me: Chicken breast and thigh with salsa verde and chicken jus. Loved the chicken two ways – the deep fried thigh had a great crunch to it. The salsa verde was fresh and flavourful. The chicken jus was rich and smooth. Great showcase of execution and technique. Now…. 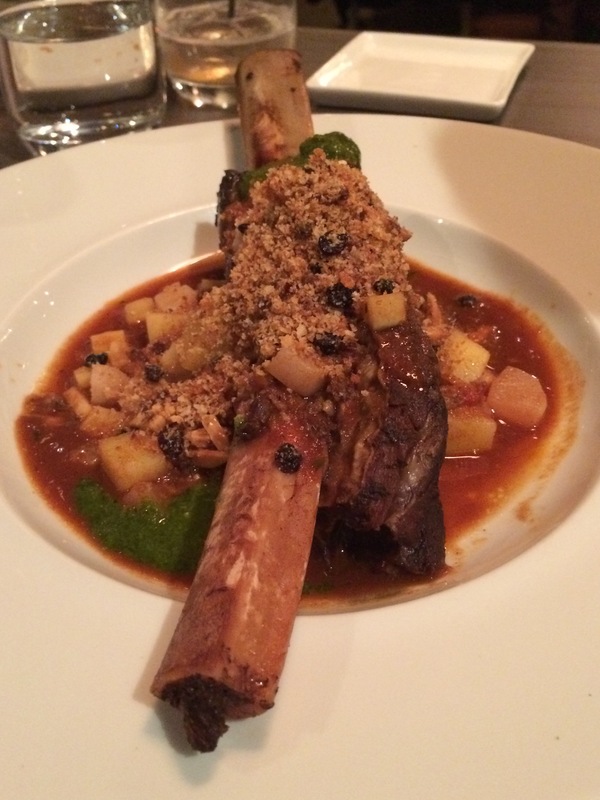 Le Fantome offers another dish which you can add to your tasting for a great fee. 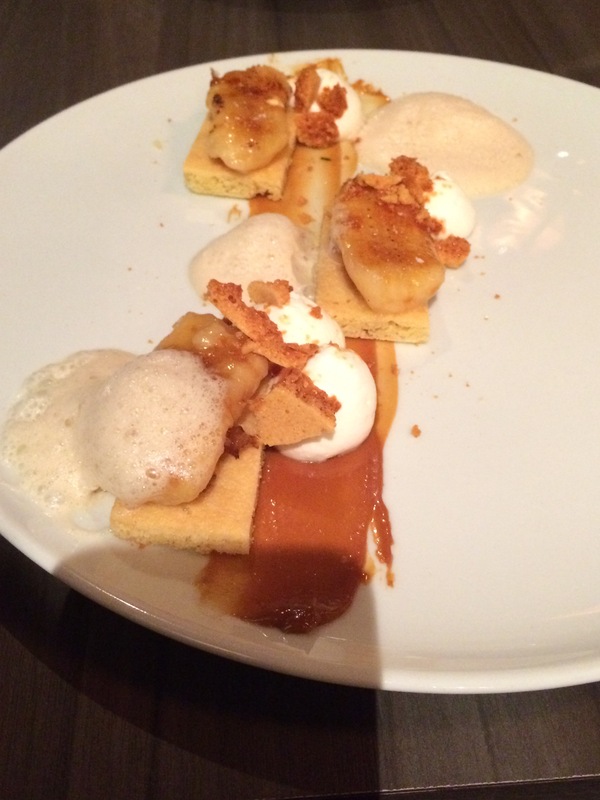 It is the dish that they are know for early in their existence: a PBJ and foie gras sandwich on toasted brioche. Of course I needed to try it! 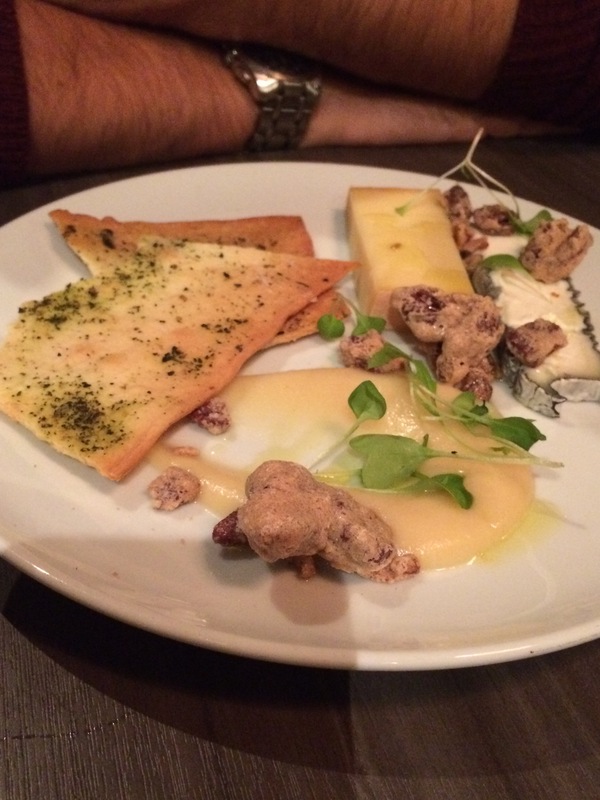 Just amazing – if you don’t like foie gras, it won’t work for you. For the rest of us though, such a great combination – the buttery brioche, the rich sliver of foie gras, the sweet jam and the smooth peanut butter. I simply wish I could have had more! Dessert-wise, we got to try 4 different ones as the shorter tasting (which my girlfriend took) had 2 different desserts than mine. First was a raspberry sorbet sandwich. Loved the strong berry taste and the smooth sorbet texture. Second was pear with whipped mascarpone. Our favorite dessert of the night. So simple and yet so effective. Whipping the mascarpone lighten the texture and that richness was perfect with the sweet pear. Third was Corn Creme Caramel. 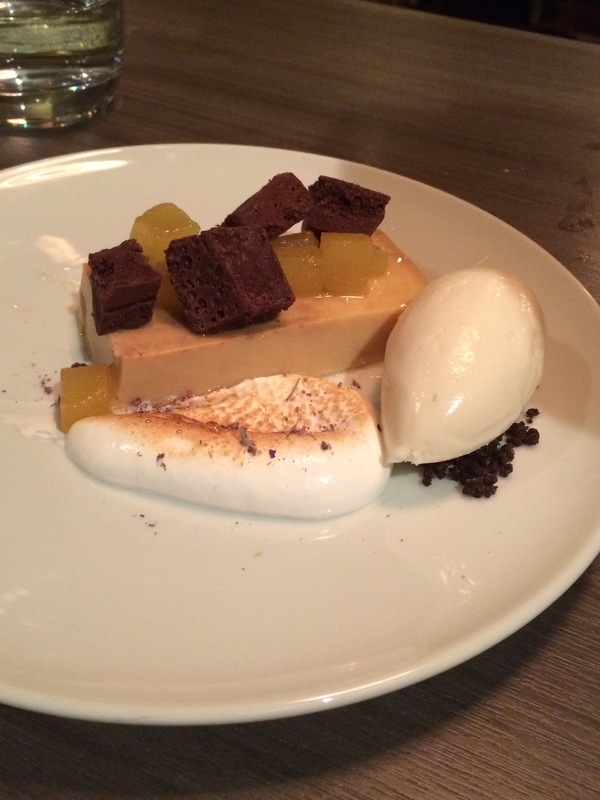 Loved the texture of the creme caramel and how the use of corn subtly changed the flavour. However, the burnt caramel sauce didn’t work for either of us. It felt too burnt and left a taste that lacked the sweetness we wanted. The final dessert was a pair of Jade Orange candies. A bit-sized hit of nice orange flavour. No complaints here. 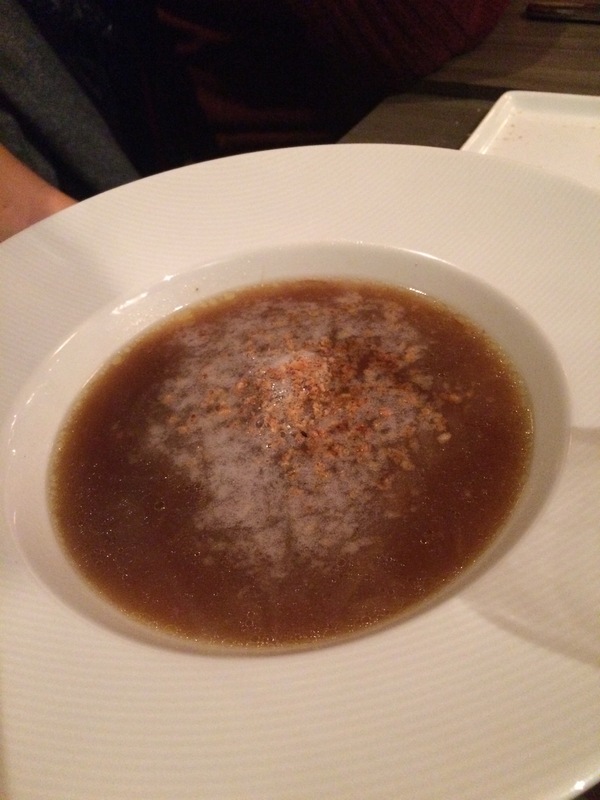 Le Fantôme’s tasting menu spoke of a refined and well-executed cuisine focused on the market that is able to have some fun at the same time. I very much enjoyed the experience of following chef Morris’ inspirations and seeing where he and his staff would take us. A excellent date night all-around and that was all that mattered. Thanks to chef Morris and Kabir. Pleasure having you in the neighbourhood. There are so many restaurants in Montreal that I wish to check out but sadly I don’t have enough time (or frankly money if we are being truthful). For the part 3 years, the October-November event of MTL à Table has allowed me to get to certain restaurants at a reduced price which I am very thankfully for. When I first looked at the restaurants participating this year, the one that leaped off the page for me was Lili Co. Originally a small Plateau restaurant, partners Catherine Draws and David Pellizzari moved into a bigger space on Saint-Laurent earlier this year. Reading the big reviews they have gotten over the past few years – including a most recent one in the Gazette in July – Lili Co.’s use of offal and off-cuts really intrigued me and had me pinning for a visit. Sadly, the MTL à Table menu didn’t have any of that – unless you paid a little extra – but I still wanted to go and give them a try. Visually, Lili Co. is a nice clean space. The main focus is on the two wrap-around bars which circle both the bar area and the open kitchen where you can watch Chef David and his crew do their work. In fact, outside of a few spots – including where we were sadly! – the entire room is set up to face the kitchen. Service was quick and efficient. Noise level was pretty loud given the room was full. As such, there was background music throughout the night but I honestly couldn’t tell you what it was. It is not the most fancy room around but sharp nevertheless. 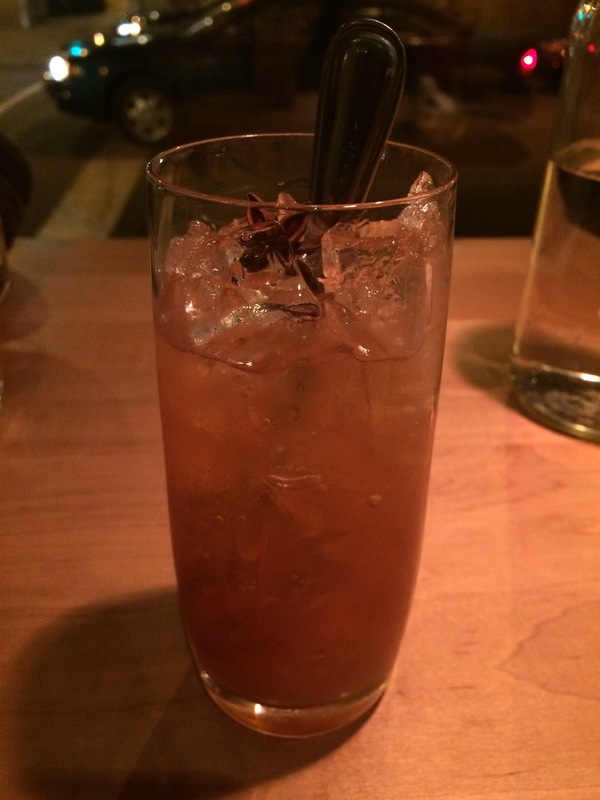 I felt like a cocktail this evening so I tried one of their seasonal specialities – The “Sans nom d’automne” – zubrowska, cachaca, natural apple juice, teapot bitters and star anise. I like this one in theory but the flavour left me indifferent. 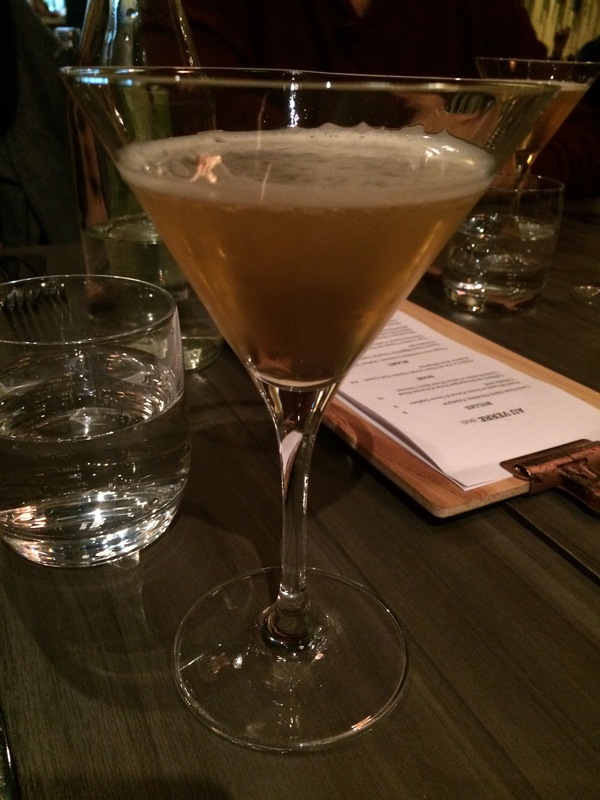 The sweetness of the cachaca and the apple juice were not noticeable. I was left primarily with the bitterness and the zubrowska – not really I had hoped for. With the cocktail consumed, we moved on the food. 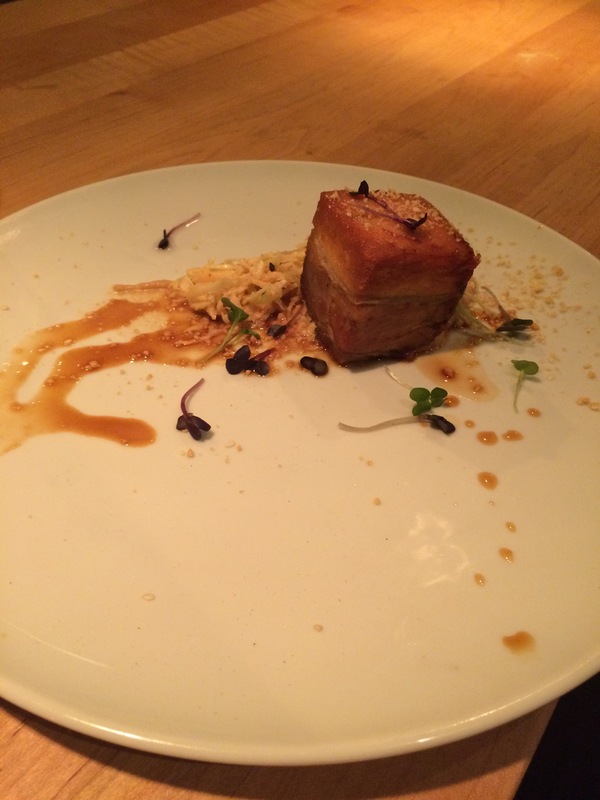 First up was the pork belly served with cashew butter and creamy coleslaw. A generous peace of fatty pork with a nice crispiness to the skin. The creamy coleslaw paired well with the meat. The cashew butter was nice as well. 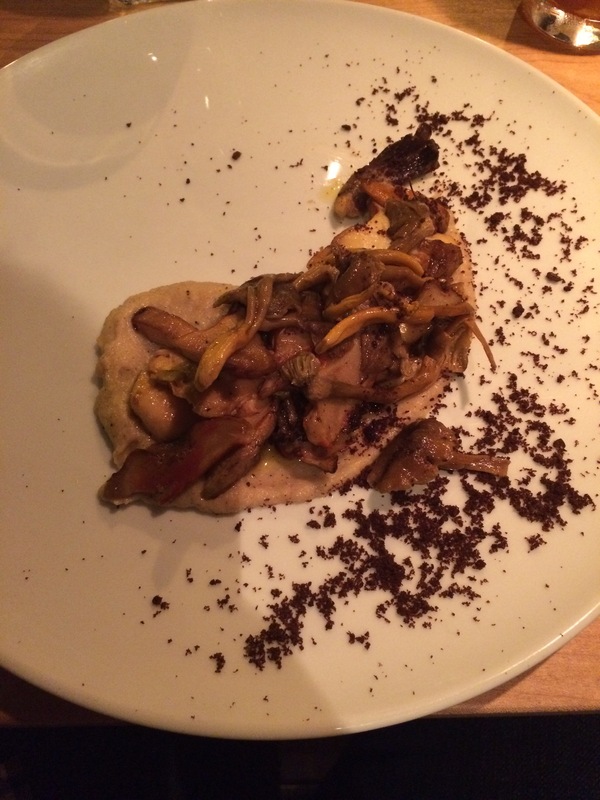 Our other starter was wild mushrooms poached in butter served with caramelized cauliflower purée and black bread crumbs. A simple dish but so well executed and delicious. The mushrooms were soften slightly with their wonderful earthiness intact. The real star though was the cauliflower puree – so rich and smooth. Very enjoyable. Our second course started with Gnocchi à la fajiole served with romano beans, smoked tomatoes and parmigiana. A nice creamy sauce paired well with the pillowy gnocchi and the beans. 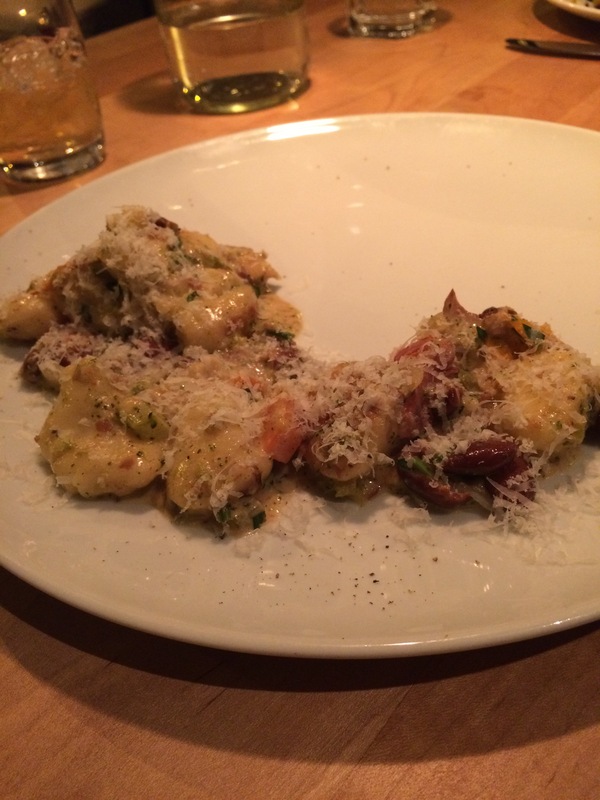 Only complaint would be the portion size – definitely would have been nice to have a few extra gnocchi! 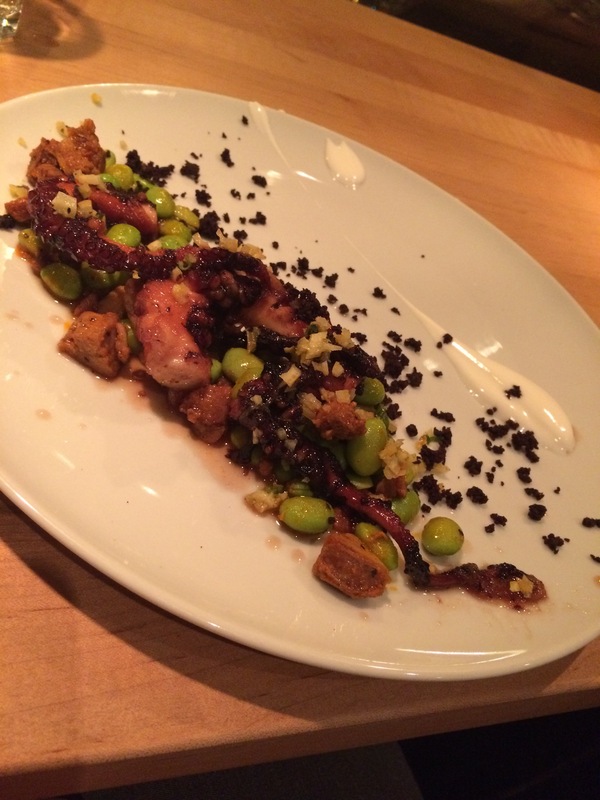 The second main was grilled octopus with a hibiscus glaze, chorizo, soy beans, black olive powder and lemon. The hit of the evening for us. The mixture of the glaze and the chorizo gave the tender octopus a hint of both sweetness and spiciness. The soy beans added a little extra sustenance to the plate. Definitely a dish I would order again. 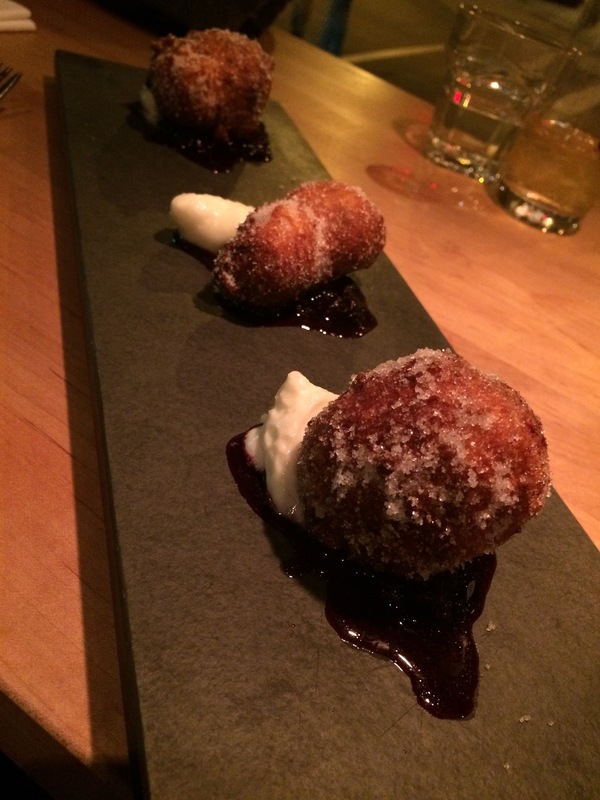 For dessert, we were treated to house doughnuts with lemon mousse and huckleberry jam. The doughnuts were light and fluffy in the inside with a nice crunch on the outside. Add the sugar coating to the jam and the mousse and you have a nice dessert right there. 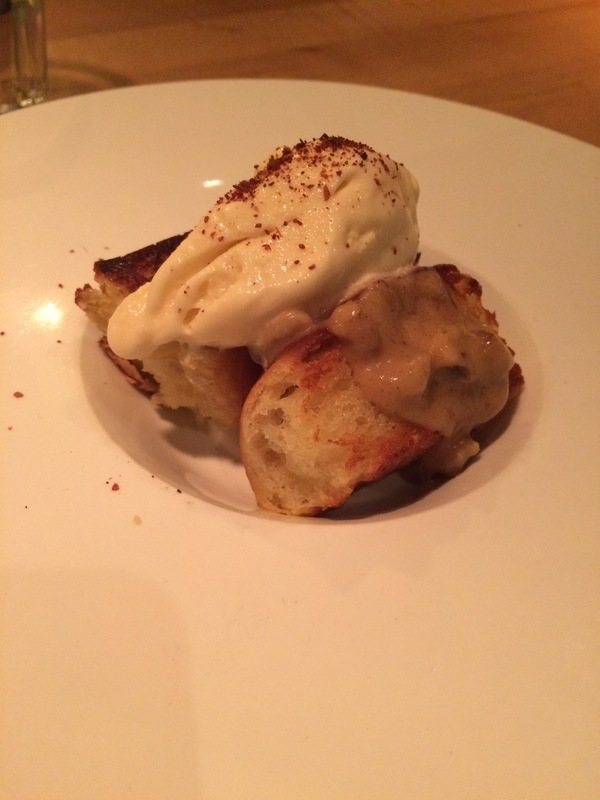 The final dessert was a brioche with a nut beurre monté, sumac and a wild flower glace au miel. 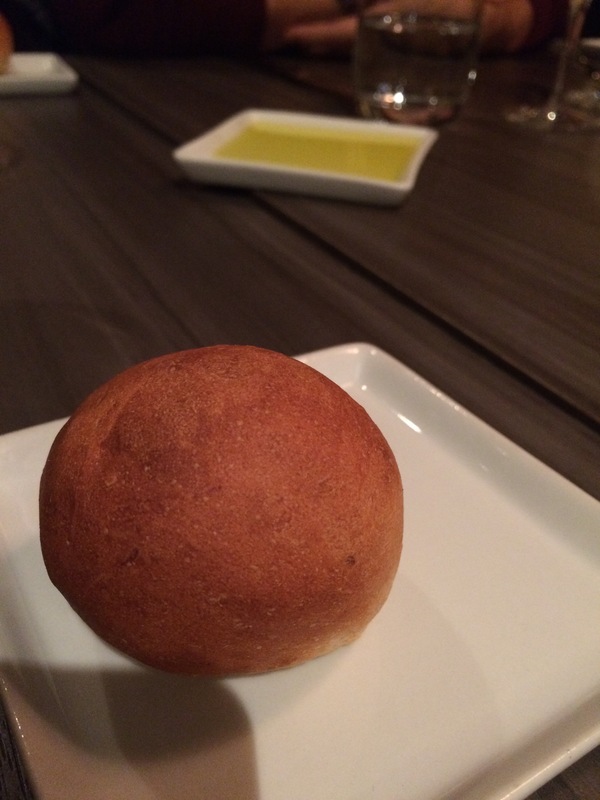 Just like the doughnuts, the brioche was nice and fluffy. The special touches of the beurre monté and the glace au miel provided some nice sweetness and richness. 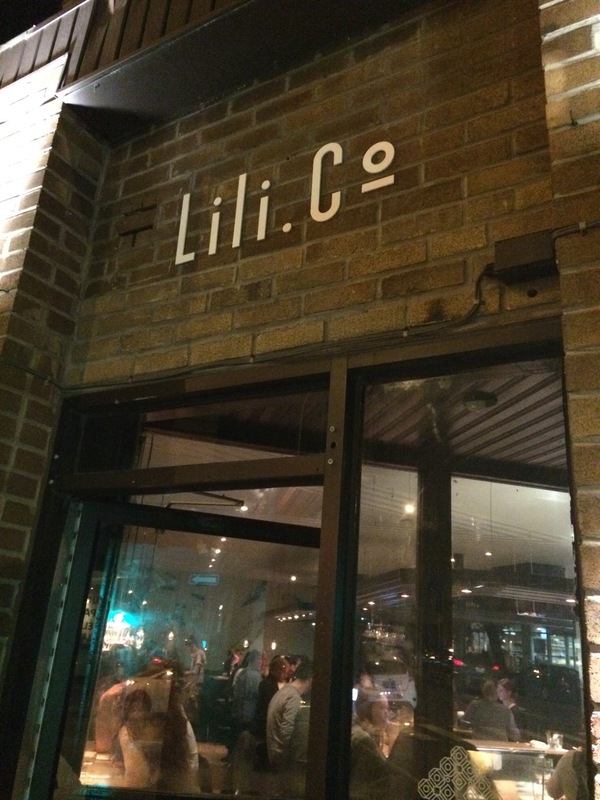 I’ll admit I was disappointed that no offal or off-cut dishes were present in the menu option – since that is what attracted me to Lili Co in the first place – but in the end, that is on me for having waiting until MTL à Table to finally visit Lili Co. 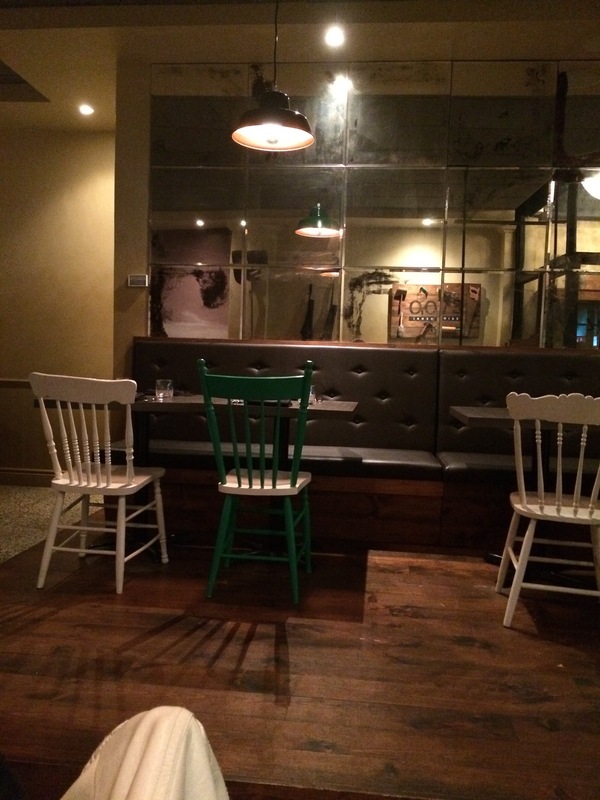 The food was excellent and the atmosphere enjoyable – you can see why they needed to move into bigger digs this year. This meal simply reinforced that I will need to come back again. Looking forward to visiting chef David and Catherine on a more regular occasion.